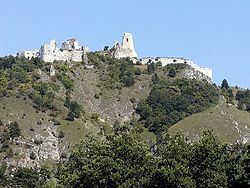 Čachtice Castle (Slovak pronunciation: [ˈtʃaxcitsɛ]; Slovak: Čachtický hrad, Hungarian: Csejte vára) is a castle ruin in Slovakia next to the village of Čachtice. It stands on a hill featuring rare plants, and has been declared a national nature reserve for this reason. The castle was a residence and later the prison of the Countess Elizabeth Báthory, who is alleged to have been the world's most prolific female serial killer. Čachtice was built in the mid-13th century by Kazimir from the Hont-Pázmány gens as a sentry on the road to Moravia. Later, it belonged to Máté Csák, the Stibor family, and then to Elizabeth Báthory. Čachtice, its surrounding lands and villages, was a wedding gift from the Nádasdy family upon Elizabeth's marriage to Ferenc Nádasdy in 1575. Originally, Čachtice was a Romanesque castle with an interesting horseshoe shaped residence tower. It was turned into a Gothic castle later and its size was increased in the 15th and 16th centuries. A Renaissance renovation followed in the 17th century. Finally, in 1708 the castle was captured and plundered by the rebels of Ferenc II Rákoci AKA Francis II Rákóczi. It has been in decay since. Along with the Orava Castle, the Čachtice Castle was used as the location for Count Orlok's castle in Nosferatu. A slightly dressed up version of Čachtice is used for the exterior shots of Baron Gorc's castle in the 1981 Czechoslovakian comedy The Mysterious Castle in the Carpathians. Čachtice was used as the castle ruins set featured in the opening sequence of the 1996 fantasy movie Dragonheart by Universal Pictures starring Dennis Quaid. The live album Channeling of Lady Elizabeth Bathory by multigenre jam band Štefánik, Perný & Kollár feat. Kofi was recorded in Višňové village, under the Čachtice Castle in 2010. The Čachtice Castle was featured in the "Castle of the Blood Countess" episode of the ABC Family show The Scariest Places on Earth, as well as the August 2008 episode "Tortured Souls" on the SyFy channels series Ghost Hunters International. Juraj Jakubisko's 2008 film Bathory is set in the Čachtice Castle, where some scenes were filmed..
^ "Castles and More Castles (Slovakia)". Iarelative.com. 1996-06-06. Retrieved 2012-09-15. ^ "Channeling Of Lady Elizabeth Bathory feat. Kofi – Stefanik, Perny & Kollar – Listen and discover music at". Last.fm. 2012-07-04. Retrieved 2012-09-15. Bessenyei, József (2005). A Nádasdyak. General Press Kiadó. ISBN 963-9598-65-8. Lengyel, Tünde and Várkonyi, Gábor (2010). Báthory Erzsébet, Egy asszony élete. General Press Kiadó. ISBN 978-963-643-168-6. Nagy, László (1984). A rossz hírű Báthoryak. Kossuth Könyvkiadó. ISBN 963-09-2308-4. Nagy, László (1987). Az erős fekete bég: Nádasdy Ferenc. Zrínyi Katonai Könyv és Lapkiadó. ISBN 963-326-933-4. Nemere, István (2009). Báthory Erzsébet magánélete. Könyvmolyképző Kiadó. ISBN 978-963-245-193-0. Péter, Katalin (1985). A csejtei várúrnő: Báthory Erzsébet. Helikon. ISBN 963-207-652-4. Rexa, Dezső (1908). Báthory Erzsébet Nádasdy Ferencné. Benkő Gyula Udvari Könyvkereskedése. Supka, Géza (c. 1940). Az átkozott asszony: Nádasdy Ferencné, Báthory Erzsébet bűnügye. Erdélyi Egyetemes Könyvtár. Szádeczky-Kardoss, Irma (1993). Báthory Erzsébet igazsága. Nestor Kiadó. ISBN 963-7523-26-X. Dvořák, Pavel (1999). Krvavá grófka: Alžbeta Bátoryová, fakty a výmysly. Slovart. ISBN 978-80-85501-07-0. Nižnánsky, Jožo (2001). Čachtická pani. Media klub. ISBN 80-88963-52-4. Wikimedia Commons has media related to Čachtice Castle. This page was last edited on 10 January 2019, at 05:48 (UTC).